Royal Caribbean announced today that its Perfect Day Island at CocoCay experiences are now ready to book for upcoming sailings from May 2019 and beyond. Guests booked on these sailings can now reserve their perfect day activities, including Up, Up and Away, a tethered helium balloon that takes guests to new heights 450 feet above the island, and Thrill Waterpark, with the tallest waterslide in North America. The new experiences may be booked through the Cruise Planner (RoyalCaribbean.com/CruisePlanner) site. We first reported last week that Royal Caribbean had begun adding certain Perfect Day Island Experiences into the Cruise Planner for select sailings, and the cruise line has now confirmed the roll out as of today. Perfect Day at CocoCay is what Royal Caribbean is renaming its private destination in the Bahamas, which will see the island transformed with a $200 million upgrade. The new pier will open in November 2018. Jack’s Galleon will open in May 2019. 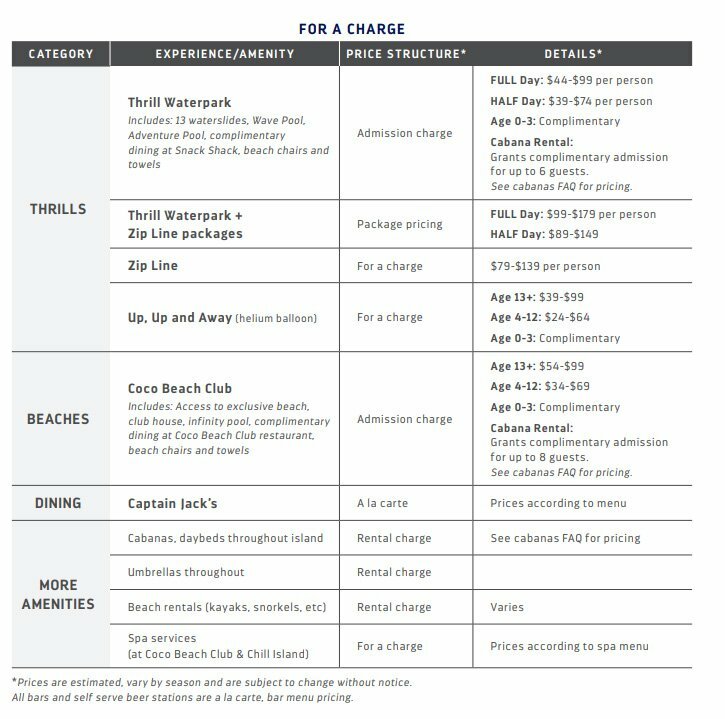 Royal Caribbean has also provided additional details as to which activities will be complimentary and which activities will have an extra charge. Perfect Day at CocoCay will offer Voom high speed internet. In addition, Beverage and Wi-Fi packages purchased onboard will be active on the island. You can also enjoy five new complimentary dining venues located throughout the island. Towels and beach chairs are complimentary to all cruise guests. Umbrellas are available to rent for a nominal fee. Lockers are available throughout the island for a nominal rental fee. You’ll also find complimentary freshwater showers, restrooms, and changing rooms available on the island. Perfect Day at CocoCay will offer beach umbrellas, clamshells and daybeds for a rental charge. 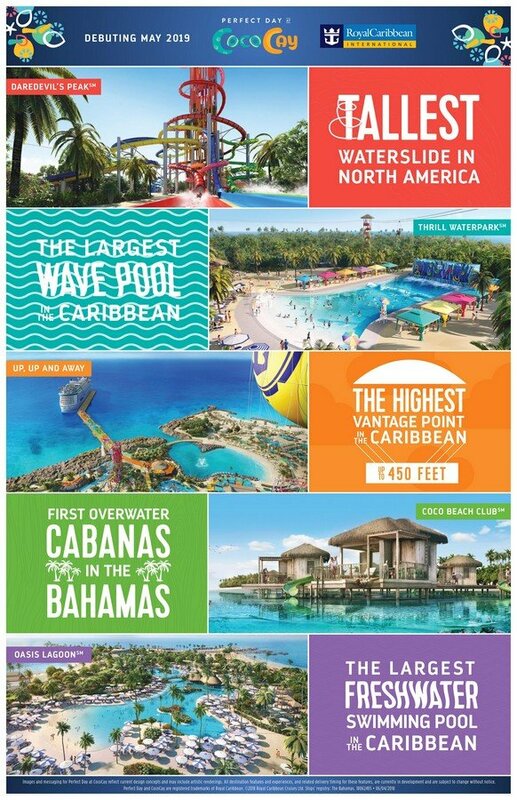 In addition, cabanas will be available at beaches, Thrill Waterpark, and Oasis Lagoon freshwater pool. Or elevate your beach day with an overwater cabana at Coco Beach Club, which accommodates up to eight guests and comes with attendant service, a private hammock, a minibar, and your own personal slide into the sea. Some cabanas come with extra perks, too. If you reserve a cabana at Thrill Waterpark, you’ll enjoy complimentary entry to all of the slides and activities inside for up to six guests. If you reserve a cabana at Coco Beach Club (including the overwater cabanas), you’ll enjoy complimentary access to the club for up to eight guests. Cabana pricing varies by season. See price ranges below. There are no age restrictions for the experiences at Perfect Day at CocoCay. 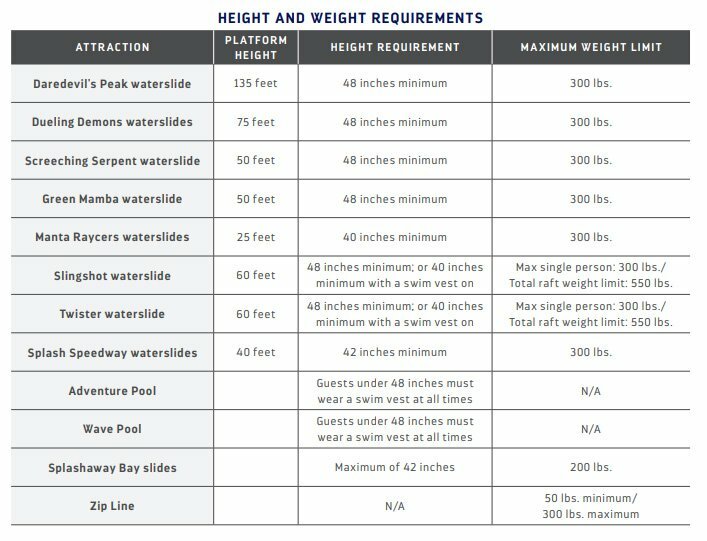 Some slides and activities have height and weight restrictions; see the chart below for specifics. Many of the island’s other experiences, such as Up, Up and Away helium balloon, Oasis Lagoon freshwater pool, and Captain Jack’s Galleon, are open to all adventurers. Royal Caribbean is partnering with h StarGuard, the leading provider of lifeguard services, to ensure there are lifeguards at every pool and every slide, as well as in recommended locations on the beach. Currently, all venues and activities are open to guests of all ages. There will not be a dedicated daycare on the island, but the Adventure Ocean team will be hosting activities onshore for children and their families. Island programming is still being developed. And Adventure Ocean will remain open onboard for families who choose to stay on the ship. 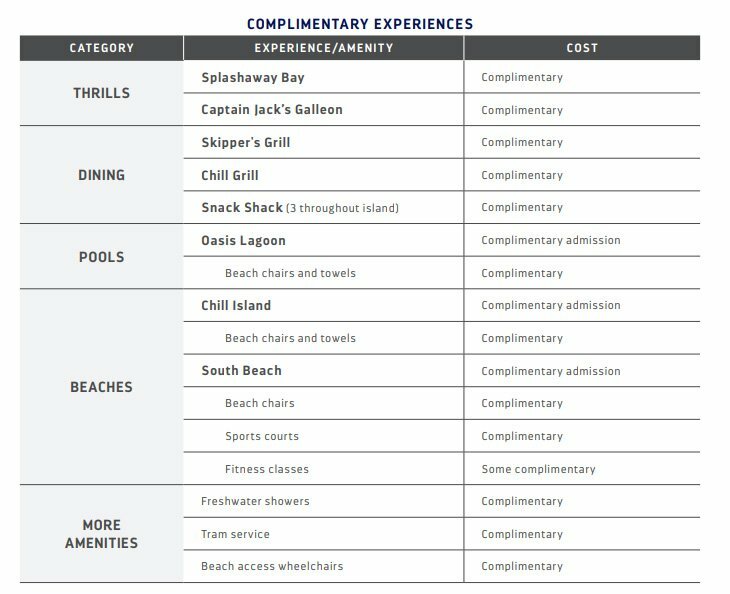 At this time, Royal Caribbean does not have plans for any exclusive areas for Crown and Anchor Society members and Suite guests. A tram service will run at all times on the island with four stops every 15 minutes: arrivals plaza, South Beach, Coco Beach Club, and Oasis Lagoon. All trams are ADA compliant. The island is ADA compliant, but some experiences are not. There are complimentary beach access wheelchairs available, and an ADA compliant tram service. Oasis Lagoon freshwater pool is also ADA compliant, as is the wave pool in Thrill Waterpark. However, the towers to the waterpark’s slides have stairs, as does the tower up to the Zip Line. You’ll find gluten free and vegetarian options available at all of the island’s dining venues, as well as options to suit most dietary needs. The island will have designated smoking areas. Most of the trash is recycled, while some is sent to the ship to be disposed of properly. Additionally, Royal Caribbean is hard at work to reduce the use of plastics on their ships, and this effort will also extend to its private island destinations.